Magnuson Hotels, the world’s largest independent hotel group, announced today it will introduce its 2014 brand collection at the upcoming Asian American Hotel Owner convention in Philadelphia PA. The Magnuson Hotels 2014 brand collection will be unveiled Thursday March 20 at 9PM at the Philadelphia Marriott Downtown to an invitation only attendance of 650 leading Asian American Hotel Owners. 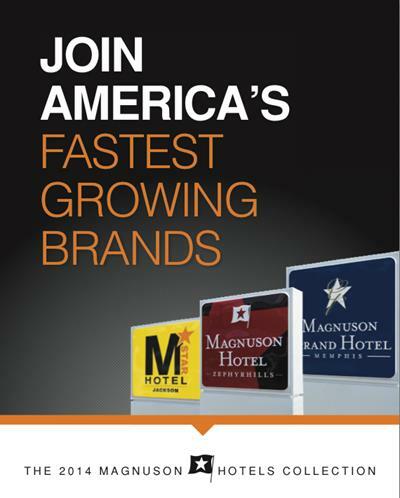 Magnuson indicates that the 2014 hotel brand platform will further advance its position as America’s fastest growing hotel brand with the addition of industry-first features. Magnuson adds that hotel owners struggling with continued flat economies can count on growth via the lowest hotel chain fee structure, updated contemporary hotel brand designs, and a cashless renovation program. With more than 11,000 members owning more than 20,000 hotels that total $128 billion in property value, the Asian American Hotel Owners Association is the largest owner bloc in the global hospitality industry. Magnuson Worldwide, headquartered in London UK and Spokane, WA is the world’s largest hotel services organisation and a top 10 global hotel chain. Magnuson Worldwide’s holdings include Global Hotel Exchange, Magnuson Hotels and CRS1.